Although there are five domesticated species of pepper, most are Capiscum anuum. Bolivian hairy chilllies are a different species, Capiscum pubescens which is perennial. Chillies were domesticated in South and Central America at least 6,000 years ago. All wild chillies are hot and sweet peppers are a result of domestication. 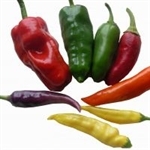 Peppers and chillies, enjoy lots of heat and water, and grow well in a greenhouse or polytunnel. The seeds need a warm place like a propagator, or kitchen windowsill, to germinate. The seedlings will be killed by frost and will not thrive when nights are cold. So unless you have a heated greenhouse or conservatory, restrain yourself from sowing them till February or March. Prick out the seedlings into 10cm pots when they have a couple of real leaves and keep them cosy until they are planted out in their final positions in April or May. Here we dig a trench in the polytunnel in spring and fill it up with well-rotted FYM. The trench is covered up with soil again and then with ground cover. The ground cover has holes 60cm apart and the plants are planted through these holes. Peppers can be used green but their flavour and sweetness improves as they ripen to red. The varieties in the mix are Hungarian hot wax, Padron, Bolivian Hairy, Czech Black, and Lemon Drop. Average 20 seeds/packet. Abundant and early yields of smooth tapering peppers. This mild chilli is ideal for pickling, roasting and frying. It starts out light yellow and matures to red. Average 20 seeds per pack. Abundant and early yields of smooth tapering pepper. The real name of these is Paprika Rocni Korinova pro pole Hodiniska Sladka Vzprimena which means sweet upright from Hodenin, but that is a bit of a mouth-full, These are peppers for making paprika powder. Of course you can also eat them fresh too. They are sweet, in the sense that they are not hot. To make your own paprika, dry them until they are crisp. (I did them in a dehydrator and then finished them off in a slow oven. (A window sill in a warm room might do it), then grind in a coffee grinder. They were quite early to ripen, we grew them indoors but they might be worth a shot outdoors.